CAPE CANAVERAL, Fla. – When the space shuttle Discovery makes its final voyage to the International Space Station on Thursday (Feb. 24), it will haul with it one of the last American additions to the multinational laboratory – a walk-in closet for the crewmembers living aboard the orbiting outpost. The storage module, formally known as the Permanent Multipurpose Module, or PMM, will provide additional space on the station to warehouse equipment and other extra components. "We have a bit of a stowage crisis on board," Scott Higginbotham, NASA's payload manager for Discovery's upcoming mission, told SPACE.com. "With the end of the shuttle program, we're trying to pre-position supplies on the station, and we're running out of good space to stash all that." Discovery is slated to launch on the STS-133 mission at 4:50 p.m. EST (2150 GMT) from Kennedy Space Center in Cape Canaveral. The shuttle and its crew will deliver the module to the ISS, and permanently attach it to the station's Node 1 Nader port – the Earth-facing side of the American Unity node. The PMM will be ferried to the space station inside Discovery's payload bay, and the module itself will be packed with critical spare parts, including a spare treadmill and parts for the station's thermal control and water management systems. It is about 21 feet (6.4 meters) long and 15 feet (4.5 meters) wide. The capsule will also carry a dexterous humanoid robot, Robonaut 2, to the International Space Station. Robonaut 2 will serve as a helper droid for the station's astronaut crew and perform tests that aimed at improving its functions for future missions. "The PMM will be delivering 6,500 pounds (over 2,900 kilograms) of cargo," said Dan Hartman, integration and mission operations manager for the International Space Station program. "The PMM will primarily be used to help us with our overall stowage and logistics concerns. We've been stuffing these flights completely full, and we tend to overflow ourselves on the allowable stowage locations." 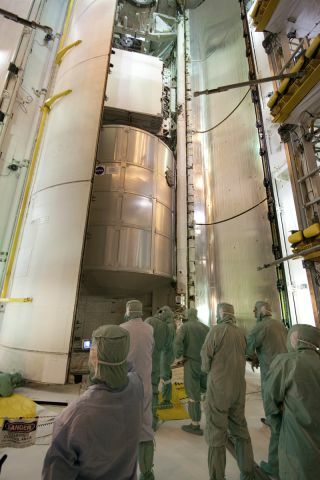 Once it is installed on the station, astronauts will also be able to conduct experiments inside the PMM, such as fluid physics, materials science, biology and biotechnology research. The space closet was converted into its current configuration from a multipurpose cargo module, called Leonardo, which was used to deliver supplies to the International Space Station on short-term shuttle missions. "This module has flown seven times to the station – the first time in 2001, and the last time back in April," Higginbotham said. To prepare the module for its permanent stay in space, engineers made three main modifications: excess weight was reduced by removing hardware not required for long-duration use; the interior of the module was renovated to make it easier for station crew members to use, and the exterior of the module was equipped with a mattress-like material to protect it from micrometeroid impacts. This protective layer acts like a bullet-proof vest beneath the PMM's metallic shielding. Discovery's 11-day mission to the International Space Station will be the orbiter's 39th and final flight. It also marks NASA's 133rd shuttle mission, before the space agency brings its 30-year space shuttle program to a close. Follow SPACE.com Staff Writer Denise Chow on Twitter @denisechowas she covers Discovery's final space voyage from Cape Canaveral, Fla.